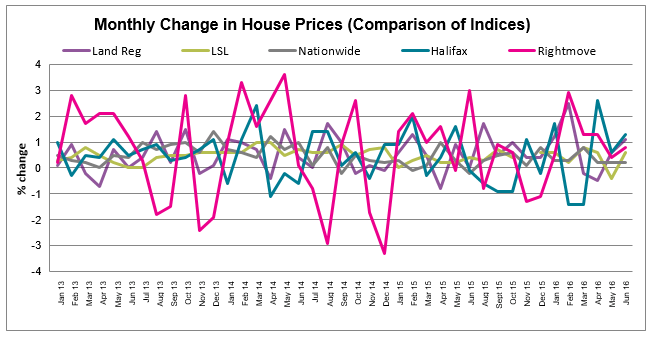 All of the major indices report house prices to be up over the past month. 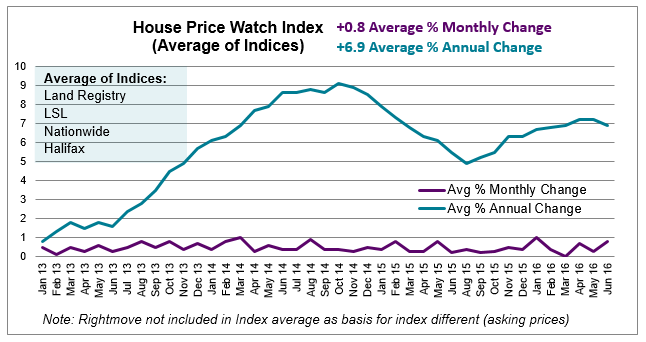 House prices are up on average 0.8% in the past month and up on average 6.9% over the past year. UK home sales in May are 11.9% lower than the same month last year (HMRC seasonally adjusted figures). April transactions were also down — 14.5% year on year. This follows record transactions in March (ahead of stamp duty changes on second homes). Total UK home sales for March- May 2016 are still 13.4% higher than the same period last year. Looking forward, fewer transactions are expected in the months ahead to offset the early surge in the year. With the recent Brexit decision, it will be difficult to determine whether the drop off in transactions is as a result of a rebalancing of early year activity or the impact of economic concerns caused by the referendum result. Leading into the referendum, there is uncertainty among potential homesellers with June new seller numbers 5.3% below the monthly average for this time of year (Rightmove). RICS similarly report a decline in new instructions in their June market survey. 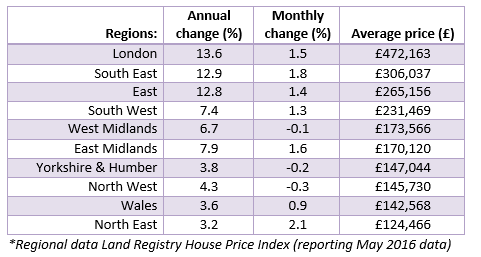 Land Registry May data indicates house prices are up in most regions. Prices are down slightly in North West, Yorkshire & Humber and West Midlands regions. Following the referendum result to leave the EU, there is speculation London may be the region most impacted. 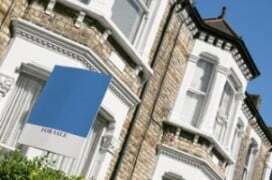 There are more investment properties in London owned by landlords and foreign investors. A drop in the value of sterling makes it cheaper for foreign investors to buy property but it also means a drop in the value of rental income some investors rely on (collected in sterling). Employment in London has been higher than other regions up 17% since the 2007 crisis, compared to 6% in the UK overall according to Nationwide. It is too soon to tell the likely impact of Brexit on jobs.